October 23, 2014, Oakland, Calif.: With the state facing serious and deepening water challenges, voters on November 4th will be asked whether to approve Proposition 1, the Water Quality, Supply and Infrastructure Improvement Act of 2014. The ballot measure would raise $7.12 billion in new general obligation bonds along with reallocating an additional $425 million of previously authorized, but unissued, bonds to fund a wide range of water-related actions and infrastructures. When the full costs of the bond are assessed, including interest payments, Proposition 1 will cost over $14 billion and be the fourth largest water bond in California history. The Pacific Institute, an internationally-renowned independent think tank focused on water issues, has released a report that helps voters untangle the complexities of the water bond measure. The Pacific Institute is taking no formal position for or against Proposition 1. 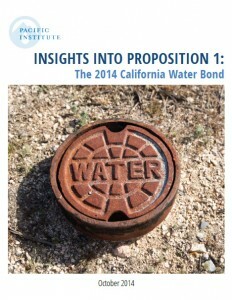 The report, Insights into Proposition 1: The 2014 California Water Bond, and its executive summary, notes that California’s pressing water troubles require expanded investment, changes in policy and institutions, and in some cases fundamentally new technologies, policies, laws, and behavior. The water bond is only one solution – and perhaps an imperfect one at that – when many are needed. With the goal of informing voters, the report analyzes the bond’s key provisions and their potential impacts. The report explains how funds would be allocated, including how the water storage funds may be divided among competing projects. It also describes how the bond addresses the needs of disadvantaged communities and ecosystems. An overarching conclusion of the report is that while the taxpayer-funded bond could provide benefits to California’s communities and the state’s environment — including specific water supply, reliability and environmental quality improvements — those benefits are not guaranteed. The Institute also concludes that Proposition 1 would have little impact on the immediate challenges posed by California’s severe drought. Some of the state’s most pressing water needs are slated to receive relatively limited portions of the total funds. For instance, measures to ensure disadvantaged communities have access to safe drinking water and their wastewater systems are improved would receive 9% of the funds and water conservation and efficiency efforts would be allocated a mere 1%. The report notes that a clear benefit of the bond would be the allocation of funds for select ecosystem protection and restoration as well as improvements to surface and groundwater quality. If Proposition 1 passes, the Institute recommends in the report that the California Water Commission develop rigorous, independent, and transparent rules governing evaluation and quantification of public benefits from proposed water storage projects. It also recommends that decisions about the rest of the funds be made with a focus on meeting public and ecosystem needs for safe and reliable water, improvements in efficient use, and reductions in the risks of future droughts and floods. The report makes it clear that passage of Proposition 1 would be just the beginning of a long-term investment to fund better institutions, smarter planning, and more effective water management strategies. It can be, at best, a down payment on our water future.